The publication of key financial performance data from the NHS in England will be delayed until after the election, the BBC understands. Regulator NHS Improvement had wanted to publish data on the scale of hospital deficits but was advised against it by the government. NHS Improvement said it was "disappointing" the results could not be published until after the election. The Department of Health and the Conservative Party did not comment. In a statement, NHS Improvement said a date for the publication of the figures had to be agreed with the Department of Health, but this had not been done when the election for 8 June was called. Reality Check: Why is NHS budget data delayed by purdah? "We sought advice and clarification in the hope that a date for publication could be agreed but it was clear, after discussions with the department, that this would not be permitted without breaching Cabinet Office guidance. "It is disappointing, but the financial results for the provider sector will have to be published after the general election." 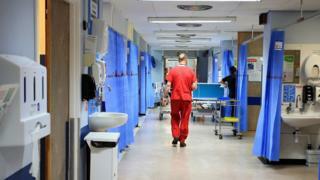 The financial state of the NHS in England has been debated intensely. In the 2015-16 financial year, hospitals and other trusts ran up deficits totalling £2.4bn. The latest figures covering the three months until the end of March will confirm the deficits for the most recent financial year, 2016-17. They are usually published ahead of NHS Improvement board meetings with the next one due before the end of May. It is understood that NHS Improvement wants to publish the figures in line with normal practice, which should be within the next week. But Whitehall officials have advised that because of so-called purdah rules there should be a delay until after polling day. The purdah convention limits civil service announcements during election campaigns. Some have argued that the rules are too restrictive. Dr Mark Porter, BMA council chairman, said: "The government is clearly running scared, refusing to face up to the funding crisis that has put the NHS at breaking point. "Delaying the release of the figures won't magically solve the very real problems our health service is facing." Dr Mark Holland, president of the Society for Acute Medicine, said: "The general election and purdah appear to be putting a number of important NHS decisions on hold. "I would argue that it is only right and just that important data pertaining to the NHS in England is published. " Shadow health secretary Jon Ashworth said: "It's a cover-up to deny the public the true picture of the NHS. "We demand full transparency so everyone knows the real state of the NHS when casting their vote." NHS England caused some raised eyebrows at the start of the campaign by announcing that the monthly performance figures, including A&E waiting times, due on 8 June would not go out then because it was polling day. A spokesman said the figures would be published on 9 June on the advice of the national statistician. Meanwhile, leading scientists, in a letter co-ordinated by the Science Media Centre, have written to the head of the civil service, Sir Jeremy Heywood, calling for clarification of the purdah rules. The signatories said that the public "are being denied access to the best experts" because university researchers felt unable to provide comment to journalists. Liberal Democrat health spokesman Norman Lamb said: "It would be wrong to try and hide this vital information until after the election. "The public deserves to know the scale of the financial crisis facing the NHS before they vote."